Biking Viking provides a support vehicle for this tour if requested. Experienced riding skills needed on this tour. 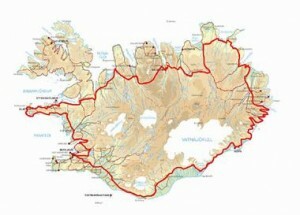 On our ride around Iceland we will experience various types of roads (dirt and paved), pass volcanoes, see a glacier lagoon, get mesmerized by the most powerful waterfall in Europe, see lakes, ride highland roads, ride through forests and fjords, eat shark and see loads of other interesting things and places! From Reykjavik we take a scenic route to Thingvellir National park, riding along Lake-Thingvellir to get there. 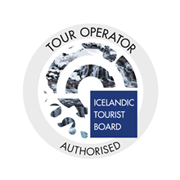 Thingvellir is a site of historical, cultural, and geological importance and is one of the most popular tourist destinations in Iceland. From there we head off to take a look at Geysir and Gullfoss waterfall where we have lunch. We enjoy the rest of our day riding through the Icelandic countryside until we reach our accommodation for the night just outside the village Hella. After breakfast we continue riding along the south coast of the country and stop by the beautiful but different waterfalls Seljalandsfoss and Skogarfoss. We pass two well-known glaciers, have lunch in Vik where we take a look at the picturesque basalt sea stacks called Reynisdrangar and the promontory Dyrholaey. We then continue our ride through seemingly endless desert fields, enjoying impressive mountain scenery, reach Europe’s biggest glacier Vatnajokull. We end this day’s journey in the village Hofn, where we can sink our eyes in the vista of the massive glacier. After fueling our bodies with breakfast and coffee we ride to Jokulsarlon (glacier lagoon) where we take a boat tour in between floating icebergs. Then we continue riding along Vatnajokull glacier and head towards the east fjords of Iceland. On this part of the trip we enjoy the magnificent mountain scenery, ride through valleys and have lunch in the tiny and atmospheric village Djupivogur. From Djupivogur we head north east, ride on fun gravel roads, mountain slopes and drive through one of Iceland’s biggest forests to the “capital” of the east-fjords Egilstadir, where we spend the night. With a stop-by at Modrudalur, the highest situated and still inhabited farm of the country (469m), we head to Asbyrgi one of nature’s wonders. Asbyrgi is a spectacular 3,5 km long canyon surrounded with up to 100 m high cliff walls. A catastrophic glacial flooding from one of Vatnajokull´s rivers is said to have formed it. From Asbyrgi we ride to and enjoy the sight of the most powerful waterfall in Europe, Dettifoss. In the afternoon we arrive at lake Myvatn and take in it’s beautiful surroundings before spending the night in the main hotel of the area. Before heading to capital town of north, Akureyri, we ride around lake Myvatn, enter an old highland road and stop by at one of Iceland’s most spectacular waterfalls Godafoss. After an easy ride on paved roads we reach Iceland’s second city Akureyri where we spend the afternoon and stay for the night. Day 7: After a steady breakfast we opt for road no.1 (the “ring-road”) and ride through various valleys, the village Blonduos and head straight to Snaefellsnes peninsula with it’s spectacular and supposedly healing glacier sitting at the far end. We ride around the glacier on different kind of roads. As we drive along the peninsula we have a few stops at interesting places such as the shark farm Bjarnarhorn where we can have a taste of traditionally prepared shark meat. Arrival late afternoon at our accommodation in Langaholt guesthouse. In stead of driving straight to Reykjavik we start the day by riding along the volcanic mountains of Snaefellssnes peninsula and take a lunch stop at the Settlement Center in Borgarnes village. Then, if the weather allows, we take two short detours to enjoy more fun roads and beautiful landscape, such as the route to Hvanneyri and Hvalfjordur (Whale-fjord). Apart from being very picturesque, the fjord is quite popular amongst motorcyclists for its curvy paved road. We will end our adventure by having dinner in the heart of Reykjavik.